Natalie was in Malaysia at a peaceful protest against Lynas Corporation, an Australian company that has been processing a rare earth ore from its Western Australian mine containing radioactive thorium and uranium in Kuantan, Malaysia. The refinery was constructed with no public consultation, no social impact assessment and no detailed environmental assessment, all of which would be mandatory in Australia. It will potentially impose millions of tonnes of toxic waste on the local community. She was arrested along with a number of local protesters, most had never been involved in a protest before. The locals were released on bail, yet Natalie remains in a crowded concrete cell. Media reported she risks 2 years jail. 659 Plenty Road Reservoir at 7.30 on Wednesday 11 June as a fund raiser for Marie Mason. Marie Mason is a loving mother of two and a long-time activist in the environmental and labor movements. In March 2008, she was arrested by federal authorities for charges related to two acts of property destruction that occurred in 1999 and 2000; no one was injured in either of them. She accepted a plea bargain and was sentenced on February 5, 2009 to just under 22 years. She is now serving the longest sentence of any “Green Scare” prisoner. The “Green Scare” is the name given to the recent arrests of animal rights and environmental activists who have been charged with acts of economic sabotage. Federal authorities have sought outrageous sentences (often Life in prison) and have publicly and legally labeled the activists as “terrorists” – despite the fact that no one has been killed or injured in any of the acts. Supporting Marie Mason does not mean agreeing with the actions that she took — but it does mean opposing the fear-mongering tactics of the federal government and the outrageous sentences they have imposed. 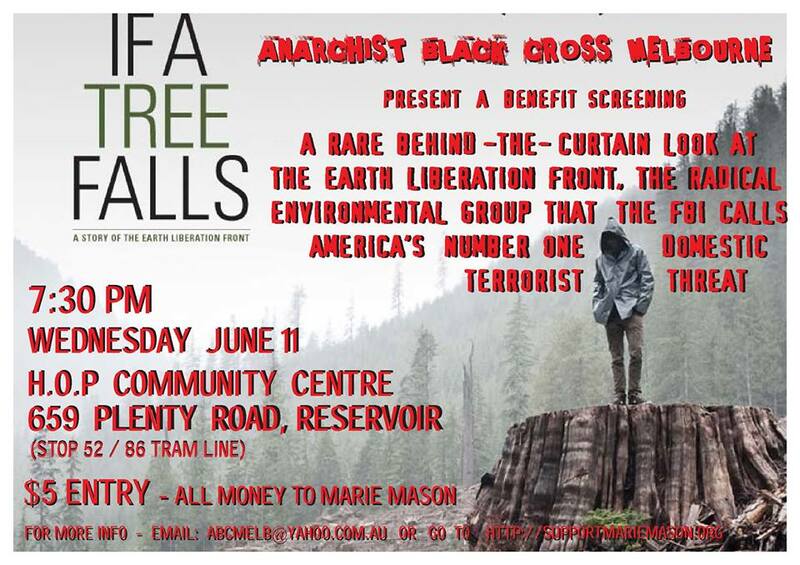 “If A Tree Falls” at the Horn Of Plenty community centre 659 Plenty Road Reservoir at 7.30 on Wednesday 11 June as a fund raiser for Marie Mason.